Laser Red LED Cut Line Light – produces a bright easy to see cut line. 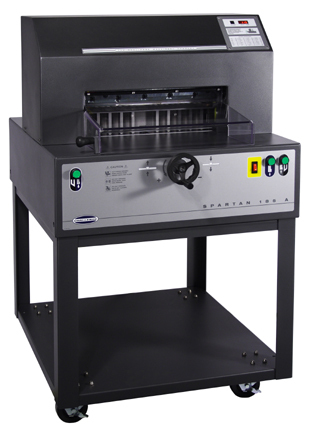 Safe – two-hand push button controls and front and rear table safety shields. Auto-Releasing Front Safety Shield – automatically pops open after each cut cycle is completed. This unique benefit eliminates the need for the operator to manually lift the front shield in order to retrieve or adjust the stock after a cut providing increased productivity and operator ease-of-use. Heavy-Duty steel, cast iron, and cast aluminum construction gives the cutter “Challenge” durability. LED Digital Backgauge Position Indicator with ±0.01” (±0.1mm) backgauge accuracy – provides for easier operator interface, higher productivity, and easier repeatable accuracy than a hard to read indicator on a scale as is used with other brands. Electric Powered Backgauge – controlled by the control console or hand-wheel for micro adjustments.